A year ago I was honored to spend several days with Dennis Ricci on a retreat with authors Steven James and Robert Dugoni. These New York Time’s best selling authors made each of us better writers just by being in the same state, let alone having them work with us one-on-one for days. If you’re a writer and ever have the rare opportunity of attending such an author retreat with these men, you should go. During those days, as I read the first part of Dennis’ book, Perilous Judgment, I knew it was a book that would take his readers by storm. Fortunately for me, Dennis agreed during that retreat to grant me a rare glimpse into his world. 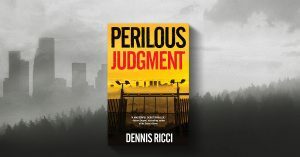 Allow me to introduce you to Dennis Ricci and his newest novel, Perilous Judgment. Dennis, what inspired you to write Perilous Judgment? Was there a single event that prompted you? The idea came from an assignment for a fiction course—scan the headlines of three newspapers and, when one grabbed my interest, come up with ten ideas for a novel based on that article. The illegal immigration issue was front-page news in Los Angeles at the time. One story I landed on was about a vote by the LA County Board of Supervisors to boycott the State of Arizona. They’d passed a law allowing local law enforcement to ask suspected illegal immigrants to produce documentation. The article mentioned the federal judge who would preside over a Justice Department suit to block the law. And a question came to me…what if that judge was smuggling people into the US? When my instructor and my wife heard the idea they both said, “wow!” And I was hooked. The possible motivations for a federal judge to engage in smuggling people drew me deep into the Mexican immigrant experience. I contrasted my own upbringing as a son of Italian immigrants with contemporary accounts from a variety of news and literary sources. The story eventually coalesced around a lead character of Irish-Mexican descent with a long-lost son whom he’d never met and was thrust back into his life by extraordinary circumstances. As a fiction writer, are parts of you infused into any of your characters or plot twists? Sure. A lot of how I think, process, deal with past mistakes and regrets, and evaluate risks shows up in my lead character, Edward Lamport. Write what you know, right? There are aspirational elements in Edward, too. How he grows and changes through the trials he faces reflect, I suppose, how I want to grow and change through my own trials and tests. What were your greatest challenges and obstacles in writing Perilous Judgment? Honestly, the most formidable challenge I had to overcome was myself…believing I was meant to be a writer, that novels were the right pursuit and use of my time. I came to realize writing fiction was not so much a calling from God as it was a responsibility to use and develop the desire and abilities He’d given me as an offering to Him. Like in the parable of the talents. Do you have a political or legal background? I don’t. My professional background is in research, management consulting, and marketing. So I’m first and foremost a student of people. I have extensive C-level consulting experience, and I used my consulting skills to find the right people and resources to help me understand the political and legal players and situations that needed to be in this story. One of my writing colleagues is an attorney who helped me a lot with matters of law and courtroom procedure. 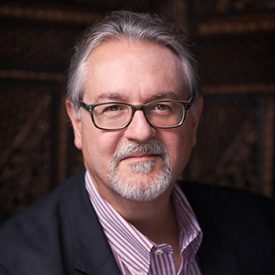 I also had the privilege of studying with James Scott Bell, one of the premier writing teachers in the world and a former attorney, who vetted how I was portraying the judge. I spend days camped out at the US Courthouse in downtown LA observing how federal judges handle hearings, trials, and sentencing. At the end of the day, stories are about people. How they face enormous challenges and change through the experience. And, in the case of Perilous Judgment, a fictional world in which the events portrayed could happen in our current reality. Have you lived in Mexico? How did you become familiar with the darker areas of your novel that required true expertise? My wife lived in Mexico for a year early in her teaching career, and I’ve visited the country several times, but most of what I needed to know came from extensive research. I read dozens of scholarly and popular books on the plight of illegal immigrants and differing viewpoints on the issue from Biblical and political perspectives. I scoured FBI, DEA, and Homeland Security data and published accounts to get my arms around the scope and depth of the illegal drug trade and money laundering, which are two sides of the same coin in Mexico. I had the privilege of consulting with a retired FBI agent, a former district attorney investigator and NCIS agent, and a recently retired Navy officer. Their insider knowledge of how investigations are handled, the realities of inter-agency cooperation, colloquial language in the worlds of law enforcement, military, and covert operations, and weaponry and military equipment was pure gold. What kind of reader is going to enjoy Perilous Judgment? I think readers who like political thrillers by David Baldacci, Joel C. Rosenberg, and Brad Thor, and legal/crime thrillers by James Scott Bell, Robert Dugoni and Steven James, will find the story elements they like in Perilous Judgment, wrapped inside an explosion of tension between the rule of law and the responsibilities of love. When did you begin writing Perilous Judgment? The idea came to me in mid-2010, and I began writing in earnest a year later. By August of 2012 I had a complete draft that was good enough to land me representation by The Blythe Daniel Agency. It took another two years and eight full rewrites to get it ready to submit to publishers. Has the name of your book always been Perilous Judgment, or did that evolve? My first working title was Midnight Justice…the early vision for the story was that the protagonist would pursue his goal after hours, using the investigative skills and instincts he’d developed as a DA investigator and as a county and federal prosecutor. I think it was during my third rewrite that the name started to feel wrong. So I brainstormed dozens of titles against the key plot points in the story…Perilous Judgment rolled out of the protagonist’s need to make choices that went against his sworn duty and put everything he held dear in peril. My agent helped me fine-tune the title, and my publisher liked it and kept it—which doesn’t always happen. How did you go about obtaining your Washington and legal system experiences? Did you already have connections, or did you have to start cold? My answer to this question is covered in the previous “legal or political background” question. When will Perilous Judgment be available, and in what forms? Can we pre-order now? Perilous Judgment is available for pre-order now on Amazon.com and other online retailers, and releases on May 17 in paperback, Kindle e-book, and audiobook formats.